Two Cailey brothers, John Leander and George Fredrick, from Champaign County, Illinois enlisted for service in the Union army. George Fredrick was born on February 22, 1840 and died on November 27, 1862, while in service with the Fifty-First Illinois Infantry. John Leander was born on April 15, 1842 and died on October 20, 1922. Mary E. Cailey (Gulick) was born on September 19, 1838 and died on March 24, 1891 in Garden City, Kansas. George W. Cailey Jr., father of the three, died in Ross County, Lyndon, Ohio on August 7, 1842 when George Fredrick was 2 1/2 years old and his youngest son, John Leander, was 4 months old. Eliza apparently re-married because she and the children, George Fredrick, John Leander and Mary, are shown to be residing in Champaign County in 1858 when George Fredrick was 18 years old. John Leander's granddaughter, Ethel (Merkel), recalls her grandfather saying that his brother George Fredrick ran away from home to join the army. 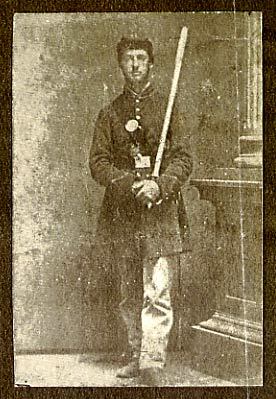 He enlisted in the Fifty-First Illinois in August, 1862. My cousin Mary Cailey Smith remembers the family story that John Leander felt sad all his life because he never saw his big brother again after the war. My father, Donald Emerson Cailey, said that George Fredrick, whom he sometimes referred to as "Fredrick", died from the measles while in service in Bowling Green, Kentucky—and military records confirm this. Photo courtesy of Martha Cailey Johnson, a Cailey family descendant. She lives in Oregon. George Cailey, Compiled Service Record, 51st Illinois Infantry, Records of the Adjutant General's Office, 1780's-1917, Record Group 94, National Archives and Records Administration, Washington, D.C.